(WITH A NEW DAY PASS OPTION!) BY MAY 1 2019. Find targeted business leads fast. Waste no more time on scattergun marketing! ListJenny™ business lead search & email finder. ListJenny™ lead search has advanced search options like job title, brand, industry, city etc. ListJenny™ combs the internet based on your criteria, so you get the RIGHT candidates. Most businesspeople are okay with receiving cold emails if they are RELEVANT, as yours will be! ListJenny™ is a search tool which finds sales leads & prospects for you. Say you need Marketing Managers in Transport from Sydney. Or Software Testers from California. Or HR Managers in Manufacturing from London. Voice Actors in Perth...the choice is yours. ListJenny™ finds & neatly collates leads based on your criteria. Build highly-targeted email contact lists. Get sales happening efficiently. Easily download your lists anytime. No contracts. Cancel your subscription anytime. ListJenny™ is "live lead generation". Find emails of prospects who suit what you're offering...e.g. a service, product, or job. Search on Job Title, Location, Industry & Advanced Search for super-targeting. Generate highly targeted leads for a flat monthly subscription with no hidden costs. 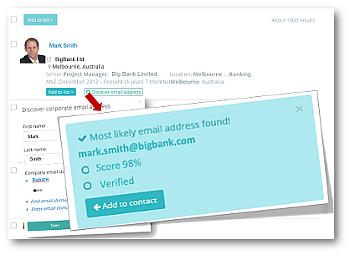 ListJenny™ has a built-in email lookup tool that gives you the option to search for a contact's publically available email address, and store this in your Contact lists in your account. You can also manually add emails. Why pay a queen's ransom for mouldy old lists? With ListJenny™ you can search fresh data with no setup fee and no expiry on use. It's one low monthly subscription with no hidden fees. In addition to searching for those Senior Decision makers, ListJenny™ is also great for recruiting. Simply search for the job titles, select your favourite candidates, and store in your Contact lists. You can use ListJenny™ to store your Contacts across multiple lists, plus keep detailed notes and other contact data. Editing and export facilities at your service! Easy to use. No credit card needed. Search for leads, save, then export and/or save the leads you want. You'll love the fresh, easy to use search page & the fast email discovery tool. If you're a BDM, Sales or Marketing Manager, or HR Manager, you'll love ListJenny™. Is there a minimum time I need to sign up for? No. We don't believe in lock-in contracts. Cancel whenever you want. Head Office is in Melbourne, Aus. ListJenny platform is securely hosted in the USA. If I want to subscribe to a plan, how do I pay? Can't I just buy a list of a bazillion emails from you? No we don't sell lists. We know from experience that finding & contacting the RIGHT people about your business is a lot more effective. 10 Clifton St Prahran 3181 VICTORIA, AUSTRALIA. 2019 © SMS Response (Aus) Pty Ltd. All Rights Reserved. ListJenny and the List Jenny mascot are registered Trade Marks.